Akaji, E.A., et al. Women’s Experience and Practice of Oral Health Care During Pregnancy. (2016) J Dent & Oral Care 2(2): 1-4. © 2016 Akaji, E.A. This is an Open access article distributed under the terms of Creative Commons Attribution 4.0 International License. Background: Oral health care in pregnant women has attracted keen attention in recent times mainly due to the increasing number of reports suggesting association between periodontal diseases and adverse pregnancy outcomes. The aim of our study was to determine the practice and perception of oral health during pregnancy and to ascertain the self-reported oral health problems or symptoms experienced by women attending a tertiary health care institution. Methods: A descriptive cross sectional study was carried out using self- administered questionnaire to obtain data from 280 women on socio-demographic data, oral health experience, attitude and practice of oral health during pregnancy. Data were analyzed using SPSS (version 17) and Graph Pad Prism for windows. Results: Two hundred and six (73.6%) cleaned their teeth once daily only (before or after breakfast) and 74 (26.4%) twice daily; 132 (47.1%) sought professional dental care in and out of pregnancy. Two hundred and fourteen (76.4%) women had experienced oral health symptoms in the index pregnancy, and 66 (23.6%) had not. Reported symptoms comprised heavy tongue with change in sense of taste [n = 95, (44.4%)], bleeding gums [n = 46, (21.5%)] and mouth odour [n= 21, (9.8%)]. Relationships of frequency of tooth cleaning, and regular dental visit for professional care with observed oral symptoms were statistically significant (p = 0.017 and 0.000 respectively). Conclusions: This study highlights the presence of considerable oral symptoms and low level of awareness of oral health care among the respondents. It exposes the need to develop a strategy to bridge the gaps in oral health practices of these women during the perinatal period. Pregnancy is characterized by psychological changes, including fluctuating hormones. These changes may increase susceptibility to oral infections such as gum diseases and hinder the body’s ability to repair and maintain soft tissues within the mouth. During pregnancy, reversible mild inflammation of the gums, called “pregnancy gingivitis” is estimated to occur in 30 – 100 percent of pregnant women. Signs of pregnancy gingivitis range from simple erythema to severe cases with pain and bleeding of the gingival tissue even though, some may be asymptomatic[3-5]. Usually, there is no significant increase in amount of plaque (tar-tar) in a pregnant woman compared with her non –pregnant state, but, the severity of the gum inflammation has proved to be higher during pregnancy than after delivery. This exaggerated inflammatory response of the gums to bacterial plaque is attributed to the increased secretion of gestational hormones (especially oestrogen and progesterone) during pregnancy[2,3,6,7]. Untreated gingivitis can lead to inflammation of the supporting apparatus of the teeth called periodontitis, believed to affect 5 – 10% of pregnant women. A Danish study looked at the self-assessment of gingival conditions in 1,935 pregnant women and found that 30% of the respondents reported one or more gingival symptoms during pregnancy. Conditions such as bleeding gums when brushing, spontaneous bleeding from the gums, gum pain, swollen gums and change in the colour of the gums were frequently reported. However, studies on the validity of self-reported gingival health have shown some underestimation of disease experience when compared to clinical evaluations where many people may not realize that gingival bleeding is a sign of inflammation. Another important dental condition that could affect pregnant women is dental caries, which is an infectious and transmissible disease. Despite having a low mortality rate, dental caries impact on self-esteem, eating ability, nutrition, speech and health on affected persons. The number of salivary cariogenic micro-organisms may increase in pregnancy with a concurrent decrease in salivary pH and buffer effect coupled with reduced plaque control. Additionally, gastric acids associated with morning sickness may lead to enamel demineralization along with change in dietary patterns such as increase in the frequency of carbohydrates and/or a craving for more cariogenic foods that may occur in pregnancy. Other oral conditions experienced by pregnant women are dental erosions, tooth mobility and benign gum lesions such as pregnancy epulis. Oral health care in pregnant women has attracted more attention in recent times mainly due to the increasing number of reports suggesting association between periodontal diseases and adverse pregnancy outcomes such as premature birth, low birth weight and pre-eclampsia[6,12]. Considering the fact that oral health practices have some demographic and cultural differences, our study aimed at determining the practice and perception of oral health issues during pregnancy and ascertaining the self-reported oral changes experienced by ante-natal attendees in a tertiary health institution in south-eastern Nigeria. The findings from this study could aid in planning and implementation of better oral health care for pregnant women. This descriptive cross-sectional study was carried out among ante-natal attendees at the Obstetrics clinic in a tertiary health care institution in South-eastern Nigeria between May 2012 and April 2013. Permission was obtained from the Head of Department, Obstetrics and Gynecology and written informed consent were obtained from the participants. Ethical approval for the study was given by the Health and Ethics Research Committee of the State Ministry of Health. A minimum sample size of 269 was derived using the formula n = z²pq/d² where z is the normal standard deviate, usually set at 1.96; a p of 0.774 was obtained from the Wandera et al. study representing the prevalence of pregnant Ugandan women that reported bad taste in the mouth. We anticipated a 90% response from the antenatal attendees so our sample size was increased by 10% (that is, 10% of 269) to 298 to accommodate non-response. A self-administered questionnaire adapted from a similar study was used to obtain data from a sample of 298 women selected systematically except those that willfully declined. The questionnaire was divided into 3 sections. Section 1 was on socio-demographic data, Section 2 was on the oral health during pregnancy, and Section 3 covered questions on attitude and practice of oral health care. The returned questionnaires with unspecified responses in more than 2 stems or questions were sorted out and excluded from analysis; 18 questionnaires were excluded. Two hundred and eighty questionnaires were analyzed using Statistical Package for Social Sciences [version 17.0 SPSS Inc. Chicago. IL] and Graphpad Prisms for windows [Version 5, San Diego, California]. Frequency statistics and cross tabulations were done, statistical significance was set at the critical value p ≤ 0.05. Out of the 280 questionnaires analyzed 160 (57.1%) were aged 25 to 34 years, 60 (21.4%) were 35 - 44 years old and 16 (5.8%) were ≥ 45 years. One hundred and thirty seven (48.9%) were civil servants and 65(23.2%) self employed; 172 (61.4%) had post secondary education and 14 (5.0%) had just a primary education. One hundred and fifty three (54.6%) and 71 (25.4%) were in their second and third trimester respectively. Table 1 shows the socio-demographic profile of the women. Two hundred and fourteen (76.4%) of the participants had oral health symptoms/problems within the index pregnancy, 66 (23.6%) had not. Ninety five (44.4%) of them reported heavy tongue with changes in perception of taste, 21 (9.8%) reported mouth odour and 46 (21.5%) had bleeding gums underscored by pain which affected eating (Figure 1). Twenty (7.1%) of respondents agreed that tooth loss is characteristic of pregnancy; 62 (22.1%) believed that pregnancy is a cause of gum disease and 92 (32.9%) agreed that dental visits were unnecessary during pregnancy. Details of the responses are shown in Table 2. Brushing habits of respondents were recorded as follows: 206 (73.6%) brushed their teeth once daily and 74 (26.4%) twice daily. Two hundred and four (72.8%) brushed once daily (before breakfast only), 20 (7.1%) brushed twice after both breakfast and supper (Figure 2). In addition, 132 (47.1%) had visited the dental clinic in and out of pregnancy for professional care and 148 (52.9%) had not. We explored the relationships between some variables and experience of oral health problems by the women and found that frequency of tooth cleaning, visit to the dental clinic and trimester of index pregnancy were significantly related to observed oral health symptoms/problems. The details are in Table 3. Accessing timely oral health care during the perinatal period is essential for maintaining the health and well-being of both women and their children. The pain, embarrassment and reluctance to eat associated with untreated oral disease can compromise nutritional intake, hinder the ability to speak and concentrate, and negatively impact self-esteem. In our study, 56% of the women disagreed that pregnancy is characterized by tooth loss, portraying correct oral health knowledge, but a greater percentage of women (85.7%) demonstrated this in a similar study conducted in Lagos. The trend observed in the responses to statements on oral health knowledge when the two studies were compared suggested that the women in our study had poorer awareness on oral health issues. This could be attributed to differences in sample characteristics and study location since Lagos is a more cosmopolitan city than Enugu. Majority (76.4%) of the respondents in our study had experienced changes in the oral cavity in the index pregnancy. This corroborates the finding in a similar study done in Bariadi District, Tanzania, where about 80% of the women observed oral changes. 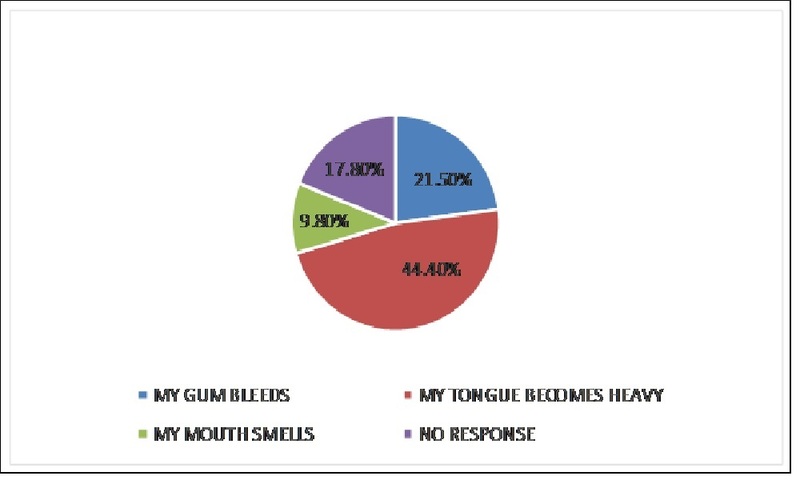 Of all the major oral symptoms observed by the participants in our study, only the finding on bleeding gums accorded with report from the Tanzanian study where 22.6% of the participants reported bleeding gums. Sadly, more than half of the participants (52.9%) in the present study (including those that had oral symptoms or changes) did not seek for professional oral health care (Table 3). While it is increasingly recognized that oral health plays an important role in overall health and well being, many women still do not visit a dentist before, during, or after pregnancy even when there are obvious signs of oral diseases. Credible reports show that women and people in general do not seek professional care when they perceive they have good oral health[7,15-17]. 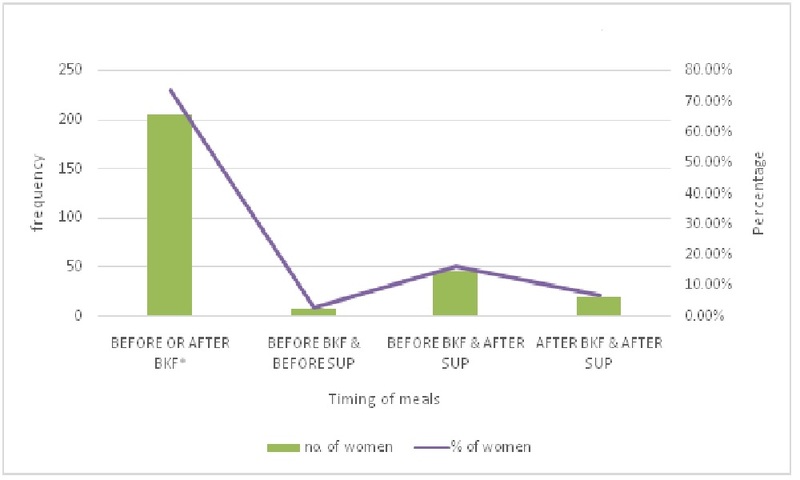 The second trimester of pregnancy is best for oral health professional care and this period (shown in Table 3) reflected the highest number of participants with oral health concerns in our study; we encouraged the women to visit a dental professional for diagnosis and treatment of oral conditions during the perinatal period and preventive care afterward. The authors believe the primary health care provider of this group of women (usually, the Obstetricians) could assist the women further via a cursory clinical oral examination to check for any dental problem and if required, the patient be referred for professional dental care. In relation to oral hygiene habits, 73.6% of the women in our study cleaned their teeth once daily and 26.4% twice daily. This is a reverse of findings from a similar study where 36.1% and 55.8% brushed once and twice daily respectively. We attributed this to oral hygiene education not being a regular feature for the women in our study. Also, majority of our participants cleaned teeth before breakfast only and the habit seemed to have developed over time even before they became pregnant. Based on this, we made concerted effort to modify their brushing habit and timing of tooth cleaning to conform to the current teaching of brushing at least twice a day, that is, after breakfast and after supper bearing in mind that oral health care in pregnancy are geared towards establishing a healthy environment through adequate plaque control and diet in expectant mothers. Fortunately, this research provided the opportunity to enlighten this group of pregnant women about the significance of oral health during the perinatal period. Oral health care in pregnancy needs a collaborative approach and ought to be tackled as such. The present study has some limitations. Data collection was by self - reporting which may be subject to recall bias and participants may or may not have answered questions about tooth brushing habits or visit to the dental clinic honestly. Within the limitations of this study, the oral health symptoms/problems of the women were quite significant. The study highlighted low awareness and gaps in the participants’ oral health care practices exposing the need to develop a focused oral health awareness strategy for them. Apart from promoting good oral hygiene habit, the practice of good oral health care will particularly reduce the incidences of dental caries and gum problems that could affect ability to eat a healthy diet which is essential for the women and their unborn babies. We hereby acknowledge the effort and cooperation of the staff of Obstetrics and Gynaecology department of the University of Nigeria Teaching Hospital in facilitating data collection. EAA: Conceptualized the study, the study protocols and analyzed the data. She contributed to the literature review, writing and editing the manuscript. OFE: Did most of the literature search, collected part of the data and assisted in data entry and writing the manuscript. IUM: Contributed to data collection and literature search. All authors read and approved the final manuscript. 1. Barak, S., Oettinger–Barak, O., Oettinger, M., et al. Common oral manifestations during pregnancy: A review. (2003) Obstet Gynecol Surv 58(9): 624- 628. 2. Laine, M.A. Effect of pregnancy on periodontal and dental health. (2002) Acta Odontol Scand 60(5): 257 – 264. 3. Silk, H., Douglass, A.B., Douglass, J.M., et al. Oral health during pregnancy. (2008) Am Fam Physician 77(8): 1139–1144. 4. Thomas, N.J., Middleton, P.F., Crowther, C.A. Oral and dental health care practices in pregnant women in Australia: a post natal survey. (2008) BMC Pregnancy Childbirth 8: 13. 5. Wandera, M.N., Engebretsen, I.M., Rwenyonyi, C.M., et al. Periodontal status, tooth loss and self-reported periodontal problems effects on oral impacts on daily performances, OIDP, in pregnant women in Uganda: a cross-sectional study. (2009) Health Qual Life Outcomes 7: 89. 6. Adeniyi, A., Agbaje, O., Braimoh, M., et al. A Survey of the Oral Health Knowledge and Practices of Pregnant Women in a Nigerian Teaching Hospital. (2011) Afr J Reprod Health 15(4): 14-19. 7. Orenuga, O.O., Sofola, O.O. A survey of knowledge, attitude and practices of antenatal mothers in Lagos Nigeria about the primary teeth. (2005) Afr J Med Med Sci 34(3): 285-291. 8. Christensen, L.B., Jeppe-Jensen, D., Petersen, P.E. Self-reported gingival conditions and self-care in the oral health of Danish women during pregnancy. (2003) J Clin Periodontol 30(11):949-953. 9. Rateitschak, K. Tooth mobility changes in pregnancy. (2006) J Periodontal Res 2(3): 199 – 206. 10. Gaffield, M.L., Gilbert, B.J., Malvitz, D.M., et al. Oral health during pregnancy: An analysis of information collected by the pregnancy risk assessment monitoring system. (2001) J Am Dent Assoc 132(7): 1009 – 1016. 11. Patel, A.R., Dhillon, S.J., Despande, A.N. Oral Health Care in Pregnancy: A Collaborative Effort by Health Care Professionals. (2014) JDS 2: 21-25. 12. Al Habashneh, R., Guthmiller, J., Levy, S., et al. Factors related to utilization of dental service during pregnancy. (2005) J Clin Periodontol 32(7): 815 – 821. 13. Araoye, M.O. Research methodology with statistics for health and social sciences. (2003) 1st ed. Ilorin: Nathadex 117-121. 14. Mwangosi, I.E.A.T., Kiango, M.M. Oral health experience during pregnancy and dental service utilization in Bariadi District, Tanzania. (2012) Tanzan J Health Res 14(2): 1-6. 15. Ifesanya, J.U., Oke, G.A. Self report of adverse gingival conditions among pregnant South-Western Nigerian women. (2013) J Dent Oral Hyg 5(2): 13-20. 16. Akaji, E.A., Jeboda, S.O., Oredugba, F.A. Comparison of Normative and Self-perceived dental needs among adolescents in Lagos-Nigeria. (2010) Niger Postgrad Med J 17(4): 283 -286. 17. Dumitrescu, A.L., Pedersen, S.S., Dogaru, B.C., et al. Association between social inhibition, mood and worry, self-reported oral health status and oral health related behaviours. (2007) Perio 4(4): 301-310. 18. Bukar, M., Audu, B.M., Adesina, O.A., at el. Oral health practices among pregnant women in North Eastern Nigeria. (2012) Niger J Clin Pract 15(3): 302-305.